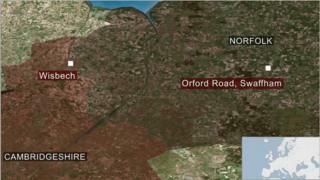 A baby has been found safe and well, three months after he and his parents were reported missing. Daniel Minton and Tory Smith were last seen with their eight-month-old son in the Orford Road area of Swaffham in Norfolk on 21 April. Norfolk Police said following intelligence, officers and a drone unit went to an address in the Wisbech area, where the family was found. Both parents have been arrested and taken to King's Lynn for questioning. Mr Minton was wanted on recall to prison and police are investigating alleged criminal offences. An appeal for help in locating them was made in June.